We fell in love with this stylish tote bag! A collage of movie poster and album cover images comprises the nylon exterior, which features a handy side pocket. Bottom has metal feet and leather-look trim that matches the double straps on the sides. There are 2 pouches and 2 zippered pockets inside the large lined interior compartment. Matching wristlet clips in and out of tote when you carry essentials only. 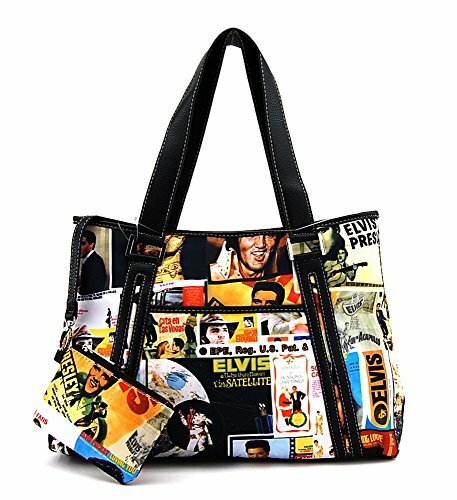 A collage of movie poster and album cover images comprises the nylon exterior, which features a handy side pocket. Bottom has metal feet and leather-look trim that matches the double straps on the sides. There are 2 pouches and 2 zippered pockets inside the large lined interior compartment. Matching wristlet clips in and out of tote when you carry essentials only. If you have any questions about this product by Elvis Presley, contact us by completing and submitting the form below. If you are looking for a specif part number, please include it with your message.